As I sit here procrastinating doing the dishes from lunch and breakfast, I decided to come up with a list of things that are better done sooner rather than later. 1. 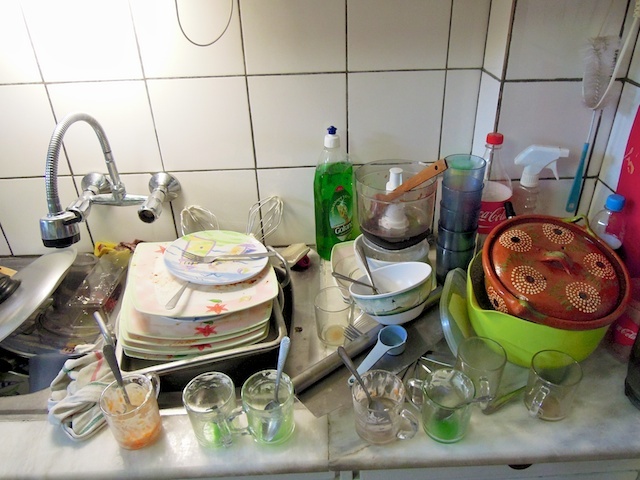 Of course my dishes. They are not going to wash themselves especially since I do not have a dishwasher. 2. Scheduling a ride for a needed trip. I don't drive where I live because it is not culturally appropriate and a little dangerous. One minute the schedule is blank and the next it is full. I have had to rearrange my weekly plans to make it work. 3. Spending time with my children. They are growing up so fast and soon they will be gone. I want them to remember that I made time for them. Plus they are a lot of fun to hang out with. 4. Telling my honey that I love him and appreciate him. 5. Skyping family or friends. I am always waiting for the perfect time for them and me. I just need to do it and if it works great. If it doesn't work at least I tried. 6. Mending relationships. The longer you wait the more time there is for imaginary problems to appear and make things worse. The longer you wait, the more courage it takes to take the first step. 7. Reaching out to those around me. I can't count the number of times I have called someone and they have replied, "I was thinking about calling you." I find to be a friend I have to be proactive. 8. Buying plane tickets. While waiting for confirmation about some trip details, we waited to buy our plane tickets for vacation. They doubled in price. By the grace of God, we found cheaper tickets on another airline. 9. Exercising. It either ends up being a shorter work out or not one at all. Christians may (and ought to) pray anytime and anywhere, but we cannot well do without a special time and place to be alone with God. Most of us find that early morning is not an easy time to pray. I wonder if there is an easy time. What are some things you procrastinating doing and wish you didn't?